Kirkwood Trading Company Saint Louis Missouri. order custom tumbler monogramming today. Tumblers like Yeti, Arctic, and Ozark are all the rage right now. Personally, I didn’t understand what all the excitement was about until my wife purchased me one for my Birthday in November. Had she not have done that I never have purchased one because it just seemed like the latest craze in drinkware. Being in the screen printing and logowear business for 20 years we see a lot of trends quickly come and quickly go. So it’s a gift so I’ll give it a try. I fill it with ice and my favorite cocktail of choice and proceed to sit in front of my fire place to watch a hockey game on TV. If you reading this looking for monograms then you already know what I was missing out on. Not only does it keep my drink cold with almost no ice melt mere feet from the fire in the fireplace, the tumbler doesn’t sweat either. My cocktail is no longer watered down after a few minutes and I can indulge in a truly great tasting cocktail from beginning to end. I’ve also become aware that I’m saving on ice production in my freezer as well. I tell you this because I understand the craze! I understand what people have been talking about and because people are so passioniate about their insulated tumblers, we decided to offer custom design and monogramming for them. Yes, completely custom. 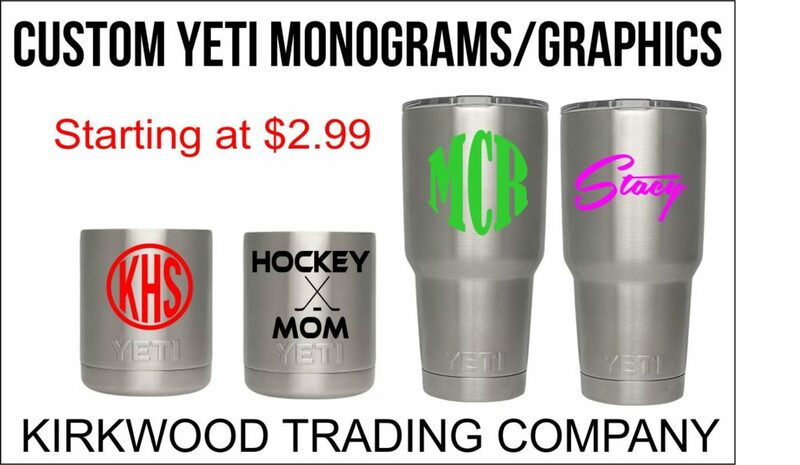 Tumbler monogramming is in itself becoming a crazy so we wanted to give people the best place to get a custom monogram or design for their tumblers. We can completely customize with tumbler monogramming, graphics, pretty much any one color design you like for $3 each plus shipping if you are out of state. The graphic will come with instructions on how to apply it as well as with care instructions on washing. Contact us at Kirkwood Trading Company and we’ll be happy to give you color options.